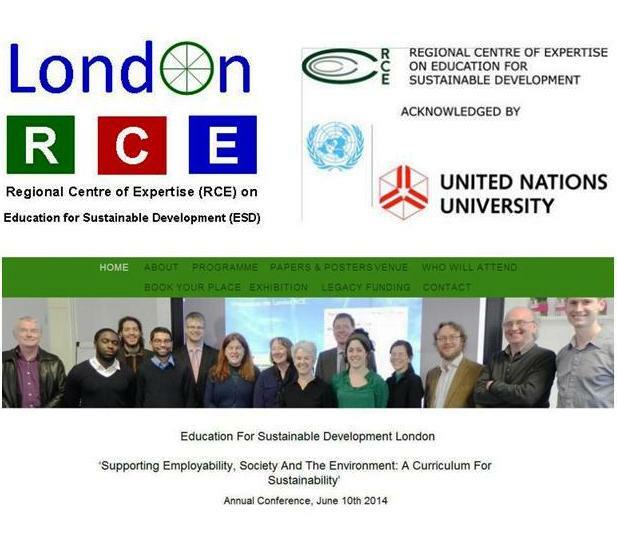 The first annual conference of the London Regional Centre of Expertise (RCE) on Education for Sustainable Development (ESD), titled ‘ESD London: Supporting employability, society and the environment: A curriculum for sustainability, will take place at London South Bank University (LSBU) on 10 June 2014. Organised in partnership with 4 All of Us, a social enterprise event organization, and supported by The Environmental Association for Universities and Colleges (EAUC), the London Universities Environmental Group (LUEG) and Green Impact of the National Union of Students (NUS), the event will bring together educationalists, NGOs and employers with the aim of developing a London-wide community of practice in order to inspire and engage the participants in promoting a sustainable future for all. It will comprise a keynote, speeches, a panel Q&A, paper and poster presentations, workshops, networking opportunities and an awards presentation. The day will begin with a welcome by Professor David Phoenix (Vice Chancellor, LSBU) and an introduction to the day by Professor Ros Wade (Chair, London RCE). Over twenty papers on ESD related themes will be presented. The formal proceedings will be followed by Green Cabaret performance by The Royal Central School of Speech and Drama. Moreover, Andrew Jones, Editor of the journal Local Economy, will deliver a brief presentation. The event will come to a close with a drinks reception and an awards presentation for the best paper and poster submissions. The London RCE on ESD is part of the UN University’s global RCE network on ESD, comprising 127 RCEs worldwide (as in February 2014).